Did you see the planet Mercury adorning the evening twilight earlier this month? 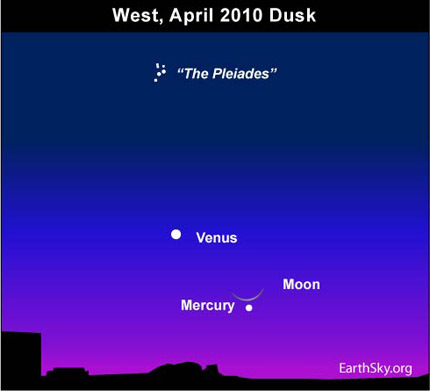 On our April 8 program, for instance, we showed you Mercury next to the blazing planet Venus at dusk and early evening. Be forewarned. Mercury will be much harder to find this evening than it was at that time. Mercury will be several to many times fainter than it was in late March and early April. Moreover, Mercury will set about 45 minutes earlier after sunset than it did a week ago. What’s more, Mercury and the blazing planet Venus will no longer appear in the same binocular field together. You will almost certainly need binoculars and an unobstructed horizon to catch Mercury after sunset. However, this world shines only about one degree (two moon-diameters) beneath the whisker-thin waxing crescent moon at dusk. Find the moon to the lower right of Venus, and use binoculars to locate Mercury below the moon. However, then, you might even need binoculars to spot tonight’s moon! New moon fell yesterday, at 7:29 a.m. Central Time. Catch the young moon this evening, and it might be the youngest moon you have ever seen. Try searching for the moon and Mercury about 35 to 55 minutes after sundown. Looking for a sky almanac? EarthSky recommends . . .
Site contents copyright © 2019 Recorder Online	except as noted. All rights reserved. | 85 queries in 1.079 seconds.